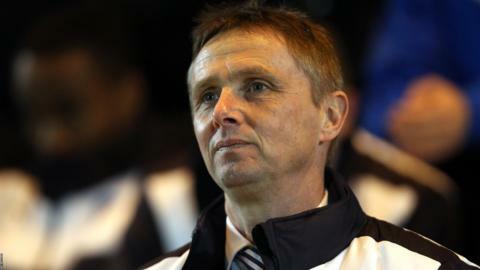 Colchester need better game management after drawing 1-1 with Chesterfield, according to boss Kevin Keen. Macauley Bonne gave the U's a 69th-minute lead, but the Spireites, who played more than 70 minutes with 10 men, soon equalised with a penalty. "Teams are vulnerable after they've scored. Our game management has got to be a lot better," said Keen, whose side are winless in 17 league games. "But mentally it's a tough place when you haven't won for a long time." Colchester remain bottom of the League One table, eight points behind Chesterfield, who occupy 20th place. "There was a few nerves out there as we hadn't won for a while," midfielder Owen Garvan told BBC Essex. "I thought us going ahead might calm us down a bit, but the opposite happened and too many individual mistakes are costing us." Despite Gary Liddle's sending off and Bonne's effort, the U's allowed Lee Novak to convert from the spot after he was felled by Richard Brindley. And Garvan was frustrated by his side's lack of creativity in the final third. "We had a lot of the ball, but we didn't make the keeper work too much. That's the most disappointing thing - we didn't create enough chances," the 28-year-old added. "It's the easy option to just go long and you're kind of counting on luck. If you want to be good, you have to try to break them down with good play - that's where our goal came from."